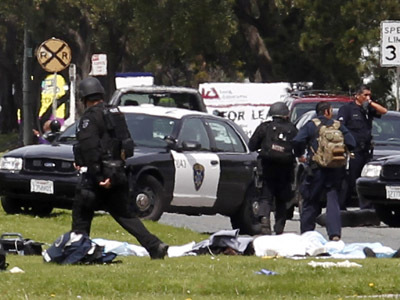 Seven people have been killed in a shooting rampage at a private Christian college in Oakland, California on Monday. Police detained and identified a 43-year-old former student as the suspect. One L. Goh is in custody after surrendering at a shopping center about an hour after the incident at Oikos University, police chief Howard Jordan said. Three more people were injured in the attack after the gunman walked into a classroom and opened fire at the college, which teaches medicine to students while emphasizing Christian ideals. It was not immediately clear what was the motive of the attack. "Get in line and I'm going to kill you all,” Goh told his victims, Reuters says quoting a survivor’s relative. Television footage showed bloodied victims on stretchers being loaded onto ambulances. The small private college mainly serves local Korean community. Its founder, Pastor Jong Kim, told the Oakland Tribune newspaper that the gunman had been a nursing student there, but was no longer enrolled.